Well, it’s that time of year again. The time when the increase in temperature is accompanied by a corresponding decrease in your neighbor’s yardwork attire. If you are fortunate, you have the sort of neighbor who looks good in less clothing while operating a vibrating rototiller but the odds are… you don’t. There are many midsummer backyard chores that can be done safely in a tube top and short shorts, but pulling and cutting large weeds is not one of them. At least not if you have any wild parsnip (Pastinaca sativa) in your yard. Wild parsnip is one of only a few common wild plants that has great potential to do you great harm… and you may not even be aware of it. In fact, there’s a good chance that you’ve encountered this plant many times and never realized the potential danger that lurked within. As its name implies, wild parsnip tends to grow wild – often in road ditches and abandoned areas – and is a member of the carrot family, closely related to the cultivated parsnips you might grow in your garden. It is easily spotted this time of year when it has 3 to 4 foot tall yellow flowers arranged in umbrella-shaped clusters characteristic of all members of the Umbelliferae carrot family. This has been a particularly successful year for wild parsnip, and you can likely see it in road ditches almost everywhere. Unlike with poison ivy, no one is immune to the effects of wild parsnip. While a poison ivy induced skin irritation is caused by the body’s own immune response, the damage from wild parsnip is caused by a chemical reaction that is very much like an accelerated sunburn. But if you think the worst that parsnip exposure will do is make you look like John Boehner or George Hamilton, think again. After exposure, redness shows up in 1 to 2 days as streaks and blotches where the cut stems dragged across the skin. The redness and burning is usually followed by a blackening of the skin and blisters which can be quite severe. Badly burned skin can be discolored for months, years, and even permanently. 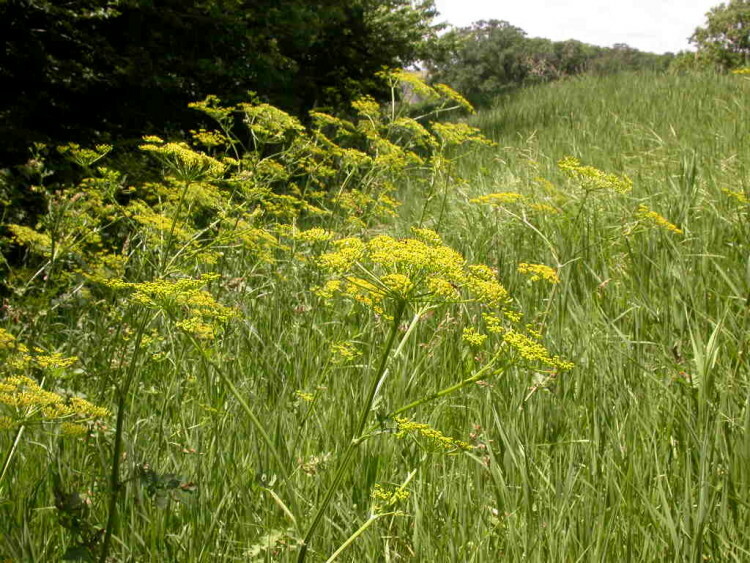 Wild parsnip is an exotic plant species native to Europe and Asia. It can be invasive and spread aggressively if not controlled. It is easily controlled, however, by cutting the root just below the ground with a spade. And, if you feel like being brave and weed whipping that patch of wild parsnip, get George Hamilton to do the job.